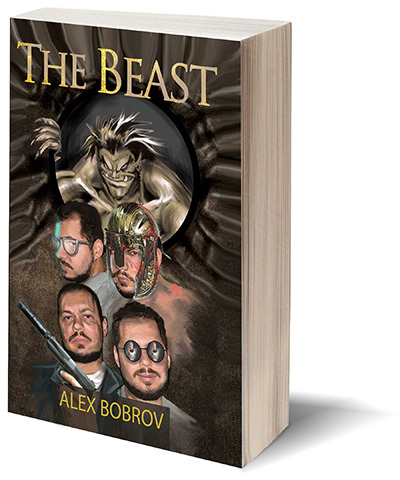 Poised precariously between imagination and madness, The Beast is a psychological and philosophical thriller and fast-paced action novel in which several personalities from parallel worlds come together in a single body at a turning point in their lives. It is a culmination of absolutely different tales, where the author balances on the edge of the conceivable, or, as he himself refers to it, on the verge of insanity. The Beast... Do you have IT in you? There's only one way to find out - read the book. This book neither shows nor teaches people how to act—it does just the opposite. It makes clear what happens to those who transgress the invisible bounds of human morality. You may find some of the episodes in the book distasteful— still, though they may make you cringe, there is truth in them all. As you near the end, however, your attitude may change for the better, and you may find the characters becoming more likable and sympathetic. If you are looking for an ordinary thriller, this book isn’t for you. There is nothing ordinary about it. But if you want to see what lies beyond the edge, what happens when a writer steps outside the bounds of standard literature, then yes, you will like this book. Although the author sincerely hopes it won't happen, you may recognize yourself at some points in the book. If you do, seek psychiatric help immediately! Your reviews are highly desired and appreciated at the above online retailers. Please note that you might be able to rate the book and/or write a review without a purchase.